DIRECTV NOW is your NEW standalone streaming service for Live TV and On Demand entertainment. 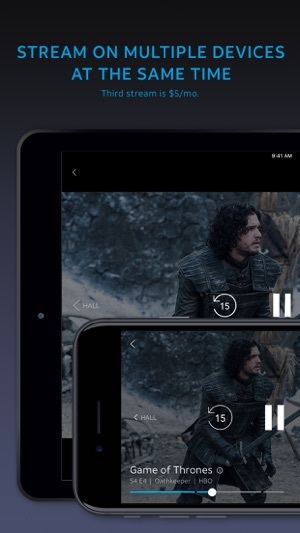 Quickly find your recently watched movies & shows, right at your fingertips. 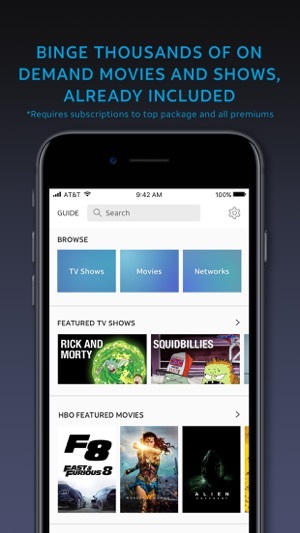 Enjoy news, sports, events and shows as they happen, or binge your favorite TV series and movies anytime, anywhere. Looking for instant access to top entertainment with no annual contract, no satellite and no hassle? 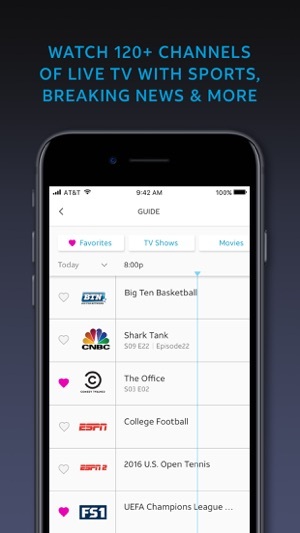 You’re one click away from rules free tv. 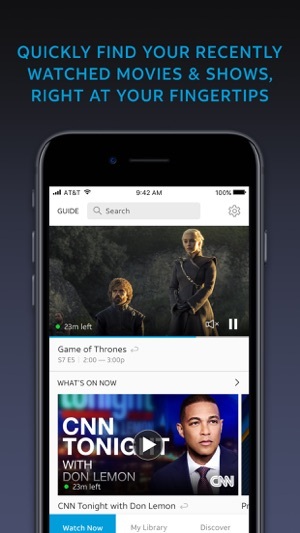 Simply install the DIRECTV NOW app and join the streaming revolution! I’m going to keep posting bad reviews until AT&T and DirecTV stop selling this scam of a service or are forced by the FCC and U.S. Attorney General to fix the app and make full refunds to all who fell for the lie. I urge anyone considering this service to stop and read the reviews here and online. You won’t be sorry. You WILL be sorry of you allow yourself to be scammed. This service relies on the app to work properly. It doesn’t. BE AWARE! If you are even able to sign in, expect the picture to freeze every few minutes. Expect for the app to constantly crash. Expect that the sound will not always be in sync with the picture. Expect that you will suddenly lose picture and see a message telling you to please choose something else to watch. Expect that you won’t get through a single program without an issue. Expect very little from this service and from DirecTV. Expect no help from the DirecTV help site or AT&T, other than them telling you to uninstall and reinstall the app every time that you go to their live chat only means of assistance. Expect absolutely NOTHING to be done to improve the service. It’s big corporate America who is accountable to NO ONE! If you want to file a formal complaint with the FCC, expect to pay a fee of $235. Though an informal complain is free to file, it’s basically useless. If you enjoy frustration and wasting your money, then DirecTV Now might just be for you! I am a traveling PT, which means every 3 months I move to a new city or state. I was excited to hear about DIRECTV now, because are used to be a DIRECTV customer. Lately I have continuously had to deal with constant freezing. At first I thought it was my Internet service. However I am now paying $65 a month for the fastest Internet speed I can get, in a studio. So there is absolutely no reason why I should be getting the constant freezing and issues that I am getting with just trying to watch television, that I pay $60 a month for. So yes, I am paying roughly $112 a month for Internet and cable service. 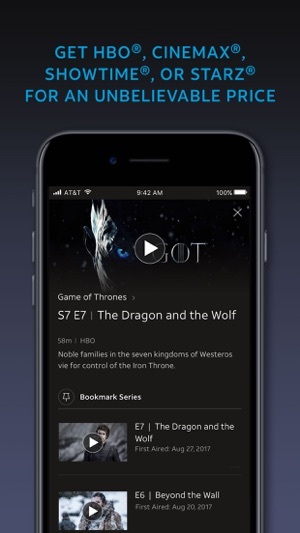 I’m trying to watch Game of Thrones, it does not remember which episode I left off the app and it continues to restart the same episode I just watched. When I record a show that I want to watch later, it refuses to allow me to watch it. It either freezes or continues to restart from the beginning every five minutes. Or for example, tonight, I recorded a movie and want to watch it. I get 20 minutes from the end and it continues to freeze and restart from the beginning I still have not been able to watch the last 20 minutes of the freakin’ and movie. Apparently, I am going to have to find another option, another streaming service because DIRECTV NOW is not living up to it’s DirectTV status!!! I’ve had other streaming services and this is by far the worst. I got it because I’m a att customer and it was a little cheaper then the rest. Only it wasn’t. First I’m suppose to get hbo for free. And get a discount for being a att unlimited plan member. After 3 months and chatting with cs numerous times they never applied either even though every time I talked to them they said they fixed the issue. And you can only chat with them through msgs on a internet chat. No number to call. Went to att store and they told me even though they started the account there they couldn’t make changes. Said the best thing to do would be to create a new account which I did. 3 months later I still don’t have hbo and they still haven’t seen the discount I’m suppose to receive. I literally just got done talking to support who assured me they had made the changes and that I would now have hbo and the discount. Still have neither. So over 6 months, two accounts, and talking with at least 8 customer service reps, going up to att which sold me the deal, I still have the same unresolved issues. I’m not sure if they are that bad at their jobs or just lying but wow. I am quitting service and deleting app. If you where smart you’d pass on this app and save yourself the headache and just try a different service provider.